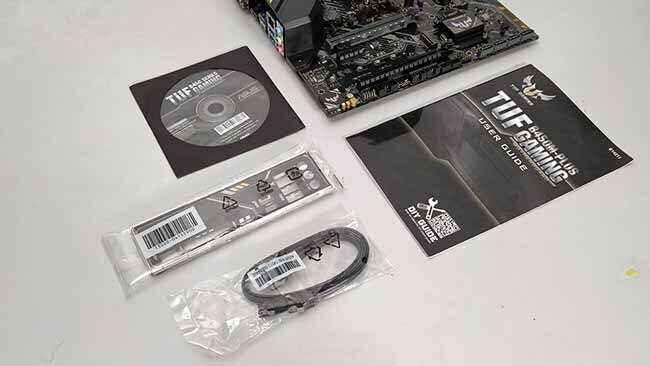 The ASUS TUF B450M is what most of the folks eager to build an AMD system have been waiting for. These B450 boards offer almost all the features of the higher-end X470 chips. The ones that you won’t find are what majority of PC builders are not going to use. CrossFireX in a x16+x8 configuration? Possible on the X470 but an absolute rarity. What’s nice of AMD is that they’ve retained the overclocking capabilities in the B450 chipset unlike Intel which tends to clamp down on such features on the H370 boards. The other prominent feature is AMD’s StoreMI which is a software solution that ships with all 400-series boards. You can use StoreMI to combine your SSD and HDD to get a single drive which offers the best of both worlds. StoreMI intelligently moves the more frequently used files onto your SSD while the less frequently ones are shifted onto the hard drive. What’s better is that StoreMI works with practically every type of non-volatile storage medium and even volatile storage such as RAM. Coming back to the TUF B450M-PLUS GAMING, it uses a 4+2 power phase VRM and has the bare essentials in terms of rear I/O. However, one thing stands out here as well, and that’s the presence of a Type-C USB port. There isn’t much RGB happening with just one array of LEDs being present in the bottom right corner of the board. As for the TUF branding, we did notice quite a lot of features such as the reinforced PCIe slot, surge protection on I/O slots and a heatsink on the VRM in this price range. Overall, the ASUS TUF B450M-PLUS GAMING shows promise to be a go-to motherboard for the average joe. While the 2nd Generation of AMD Ryzen CPUs have been out for a while, buyers have only had the choice of building systems with the newer X470 chipset to make the most of all the new features. AMD being the nice guy, does not arm-twist users into getting the new chipset since all their older X370, B350 and A320 chipsets do support the newer CPUs and APUs with a simple BIOS update. So unlike Intel, where the 8th Generation was locked down to the 300-series chipsets only, AMD offered a wide array of options to build your PC. When the 2nd Generation of Ryzen CPUs were launched, AMD still had some work to do with the B450 chipset, which is why they’ve taken this long to release the same. It’s either that or they’ve simply followed Intel’s strategy since they too only had the flagship chipset Z370 at launch with the mid-range and lower-end chipsets launching much later. The higher-end chipsets obviously cost a lot more and given how good the 2nd Generation of AMD CPUs are, it was natural for folks to gravitate towards the X470 rather than the X370. These newer chipsets also have additional features such as StoreMI which adds a lot more value than what you’d get with the competition’s offerings. 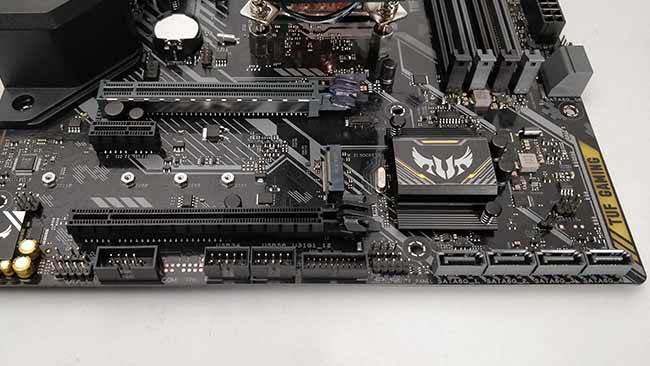 The AMD TUF B450M-PLUS GAMING motherboard is part of the first wave of B450 motherboards to be launched and it’s also part of ASUS new rebranding of their mid-range lineup. You still have the ROG for the enthusiasts, STRIX for the premium, TUF/PRIME for mid-range and entry-level. You really can’t tell if a TUF or PRIME board is better than the other without checking the specs. With the X470 boards, TUF was at the bottom of the list while in the B450 lineup, PRIME is at the bottom of the list. Also, there is a bifurcation within the TUF series as well, a plain ‘TUF’ branded unit is better than a ‘TUF GAMING’ branded unit if we look at the warranty periods. The former comes with a 5-year coverage while the latter ships with a standard 3-years. 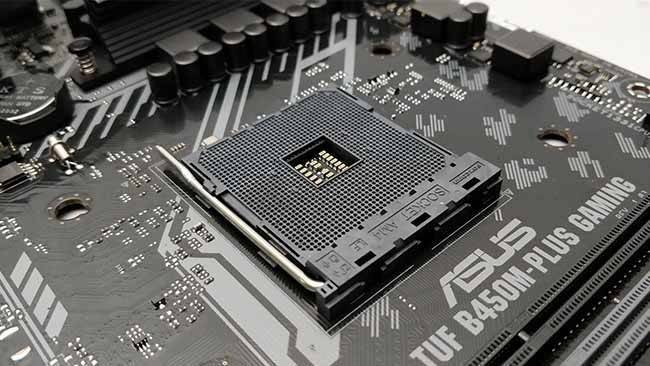 The ASUS TUF B450M-PLUS GAMING motherboard starts off as a fairly balanced unit. It comes in a mATX form-factor, has a VRM heatsink and little of the RGB. The expansion ports are well balanced in favour of mid-range build configurations but with the competition in the space turning out to be intense owing to AMD’s comeback, manufacturers are including more and more features on all their motherboards. Even in the budget-friendly segments such as for the B450 chipsets. ASUS’ TUF branding makes use of black prominently with yellow and grey being used for the accents. The packaging looks fairly simple with just the key elements being highlighted. 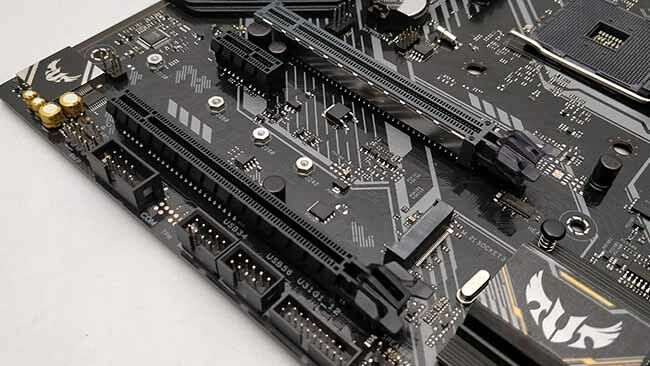 To view the detailed specification list for different versions of the motherboard, please refer to ASUS’s official website. You don’t get a lot with the ASUS TUF B450M-PLUS GAMING motherboard, just the bare essentials that include the I/O shield, M.2 screw and stand-off, Certificate of Reliability, driver disk, user guide, a pair of SATA cables and a set of stickers to make your board look a bit fancier. Aside from the stickers, there’s absolutely nothing here that can be classified as extra. It would appear that ASUS has saved some cost by not giving extra accessories, instead, they’ve added more features to the board which would normally not be available in this price range. We hope to see the competition take the same approach. Here’s the list of the entire contents of the box. Being a mATX board, the layout doesn’t seem ridiculously crowded. There’s plenty of spacing between the individual components with nothing appearing to compete for space. The ASUS TUF B450M-PLUS GAMING motherboard makes use of a 6-phase VRM design with the heatsink only covering the 4 phases that cater to the CPU and the remaining two phases that handle the iGPU are left exposed. As for the mosfets, the configuration is a combination of the ON Semiconductor 4C10B with the 4C06B. Each phases uses a MILR68 inductor along with two MIL 820uF 5K capacitors. The entire thing is controlled by the DIGI+VRM ASP1106GGQW chip. Additionally, you can see the surge protector circuits around the I/O ports. The one with the “TUF” branding on the EMI shielding is one such circuit. This isn’t something new that ASUS has added for the TUF lineup. In fact, they’ve been around for a while under the LAN Guard moniker. The two phases on the iGPU have the exact same configuration in this case unlike some of the Intel boards that AMD makes where they tend to be slightly different. The four RAM sockets are closely packed with release levers on just one side. Thankfully, they’re on the top, so removing the DIMMs shouldn’t be a pain and won’t require you to remove the GPU first. If you’ve got a cheap OEM cabinet with the motherboard mounted with no spacing on the top, then you’re in for some fun. As for the power design at the RAM, we see just the OnSemi 4C10B being used in a single phase with a MIL1R2 inductor and a 5K rated capacitor. There’s plenty of space to squeeze in a power and reset switch right next to the mosfets. Being passive components, switches shouldn’t cause any issues in close proximity to the mosfets. Also, this is generally where we see pads for probing but there are none here, and frankly, there’s no use for them on an entry-level board. Lastly, we see two SATA III 6 Gbps slots lined up with the bottom of the RAM DIMMs, this makes them accessible even with a GPU installed. 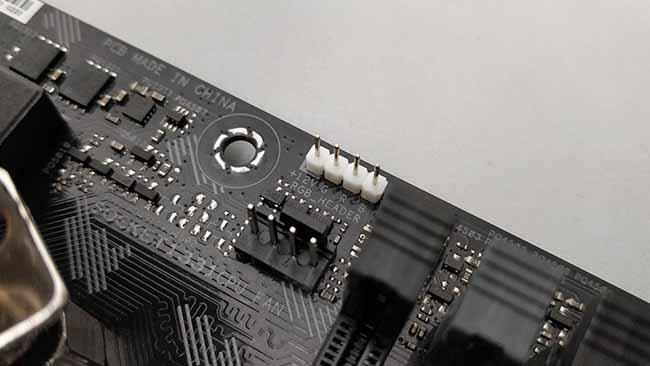 Coming to the expansion slots, the only PCIe x16 slot on the board comes with a reinforced shielding. It should be noted that the PCIe x16 only works as x16 if you have a Ryzen 1st/2nd Gen CPU plugged in, with an APU, this slot runs at x8. There’s an x1 slot right underneath the x16 slot, so in all likelihood, this will remain unused in almost all builds. 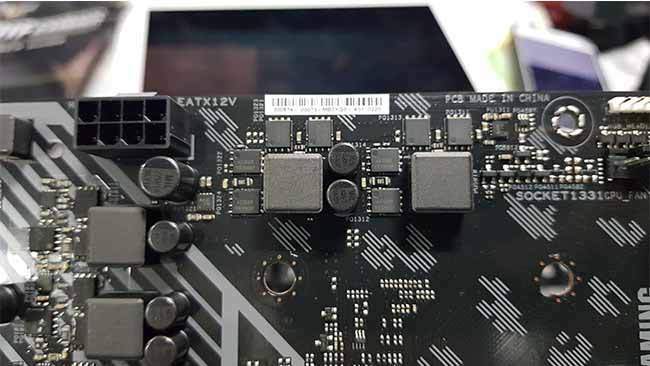 Underneath the x1 slot lies the M.2 layout and we’re glad to see support for 110mm long SSDs. Most boards in this price range tend to have the 110mm slot moved right above the 1st PCIe slot or hidden on the back in cases of smaller form factors. This way, you can install any of the M.2 cards and have easy access all the time. As for the last PCIe slot, it’s an x16 that’s wired for x8. If the first x16 slot is populated, this will only work at x4. And this is regardless of whether you have a CPU or an APU installed. So you can have a dual-GPU CrossFireX configured in an x16+x4 configuration with a Ryzen CPU installed or in x8+x4 configuration with a Ryzen APU installed. Coming to the headers on the bottom surface. 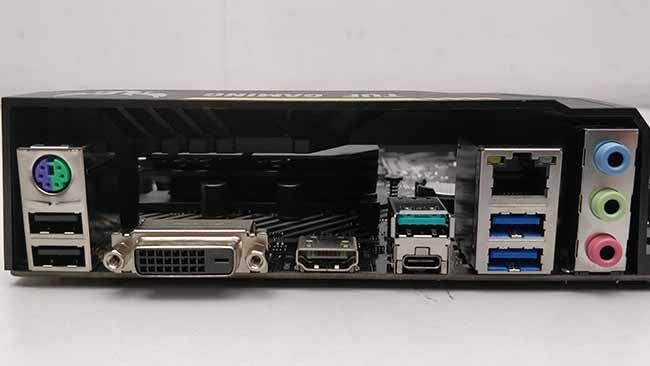 We have the usual culprits lined up including front audio, COM, 2x USB 2.0, USB 3.1 Gen1, front panel power/reset+LEDs and the remaining 4 SATA III slots with top-facing connectors. Everything seems fine and dandy except for the front panel connector which is sandwiched together with the 4-pin speaker header. While ASUS has not provided the speaker with this board, it becomes a royal pain in the rear-end to install all the cables. Since there’s no Q-connector provided, this issue is aggravated. The PCH heatsink can be much smaller with this new generation of the AMD Ryzen platform because the overall TDP has come down to less than 2W in idle stage. This means, manufacturers have more real estate to play around with. 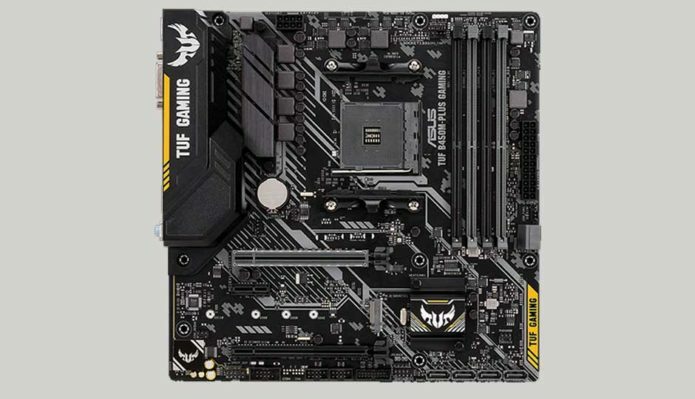 Looking at the ASUS TUF B450M-PLUS GAMING board, we don’t see a lot happening in this corner. The Clear RTC pins are placed in a visible spot with what appears to be a chassis intrusion pads right beside it. We say pads because the header is not soldered onto it. The last thing of note is the TUF GAMING branding on the right which is illuminated with ASUS AURA Sync LEDs that are placed on the back. There are six LEDs in total and the RGB is quite mellow given that it has to pass through a thick PCB. If you want more RGB madness, there’s a RGB header above the RAM slots. The X470 boards tend to have the Realtek ALC1150 or a custom solution with added OP-AMPs. 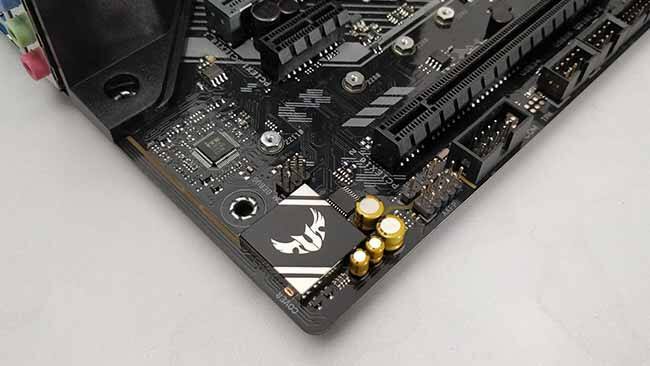 In the case of the ASUS TUF B450M-PLUS GAMING, we have the older ALC887 which was also used in the B350 boards. While the chip is capable of handling 8-channels, the rear I/O only comes with three audio jacks. So you will need additional add-in cards to make use of it, though you’re much better off getting a proper sound card if you’re going to be getting an add-in card. As for the capacitors, ASUS has used 2x 100uF 16V and 2x 10uF 16V ELNA audio capacitors though these seem to be packaged exclusively for ASUS since the 2017-2018 catalogue has no mention of capacitors with black print on gold sleeves. The audio CODEC has an EMI shielding and the entire section seems to have an isolated power supply. 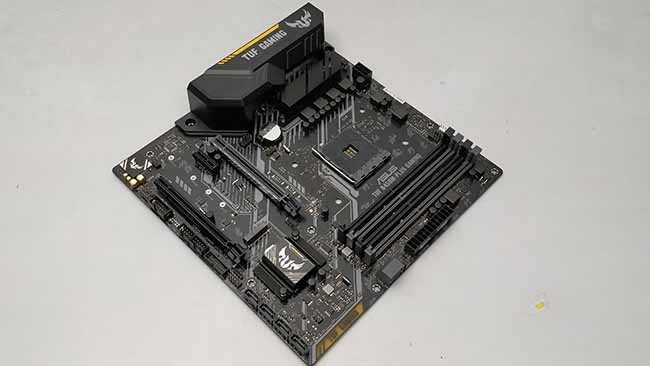 ASUS has included a DTS software solution with this motherboard the way MSI tends to ship their products with the Nahimic audio suite. The DTS solution has three profiles – Soundscape mode, Aerial mode and Tactical mode. All profiles are geared to provide positional cues based on the selected modes. The last one i.e. Tactical mode will put-up an overlay on your game screen to provide visual cues for the audio direction. Certain competitive games consider this cheating, so be careful while using it. You never know when the anti-cheat engines might flag such solutions. As of now, you’re relatively safe. The rear I/O has a sufficient set of connectivity options. There are two USB 2.0 ports and a PS/2 port for those still using ancient keyboards. Then there’s a DVI-D and HDMI port for your video output should you have an APU installed. The absence of a display port doesn’t go down well since it’s a really popular standard now. Between the HDMI and the DVI-D ports, you have gained the support of practically every display device selling right now. As for the audio ports, we’ve spoken about the same previously. All that’s left are the Gigabit Ethernet port and the USB 3.1 ports. The teal coloured one is the only USB 3.1 Gen 2 port while everything else is USB 3.1 Gen 1. Thankfully, there’s a Type-C port which is a rarity in a board in this price segment. Though, not for long since the upcoming Intel chipsets also have USB 3.1 Gen2 natively. Neither the audio ports nor the Ethernet port have gold plating on the contacts. The I/O shield follows the colour theme of the TUF gaming line and has all the connectivity options neatly labelled. It’s got a little patina-like rainbow sheen to it, if that’s something you’re into. 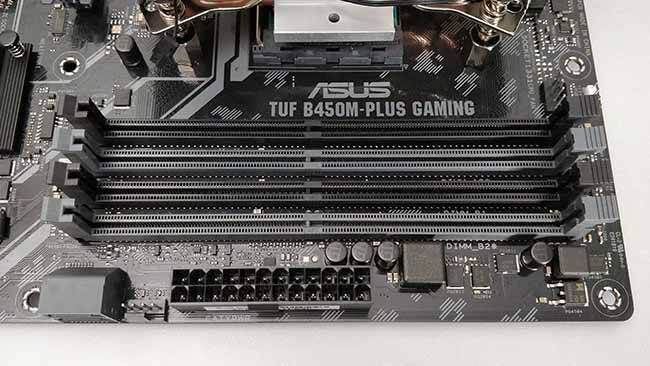 The ASUS TUF B450M-PLUS GAMING has three 4-pin fan headers. The one for the CPU is in the usual spot, then there’s one on the right face and one right beneath the CMOS battery. We couldn’t complain about the arrangement though another header on the bottom right or one high-current header for liquid coolers would have been appreciated.